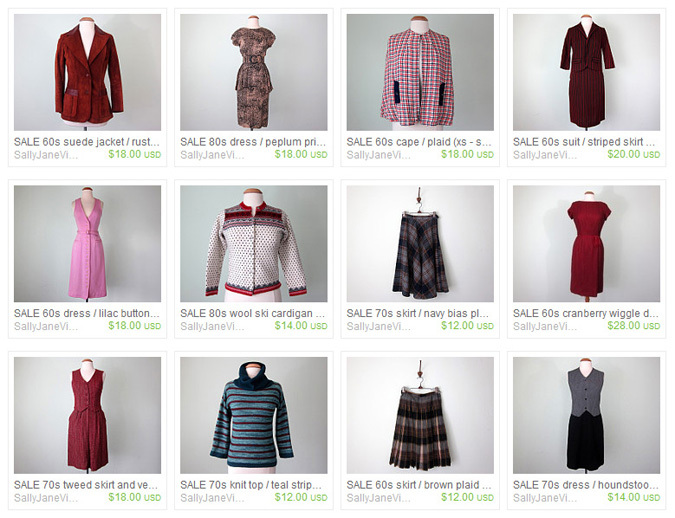 Sally Jane Vintage: The Sale is on Sale! The Sale is on Sale! Today I at hard at work going through the bags and bags of spring clothes that I've been hoarding away all winter long. It's not really fair to say that it is hard work, since I really think it is so much fun. I never remember everything I've bought and its like discovering each and every find over again. Thanks so much for helping me make some room for all of the new goodies in the shop by giving so many of the sale items new homes! I'm finally making some room on the clothing racks that hold all of the shop stock but there's more to go! So... for the next week you can take an extra 20% off everything in the shop. Even the sale items! Just use the code WINTERSALE when you checkout. Oohhh. I really like that ski cardigan. yes these wear are really cheap and full of colors nice post thanks for sharing that!